The used machinery management firm’s new website features a sleek, easy to navigate design with a completely revamped online storefront. Chicago, IL - Machinery Marketing International, a leader in online used machine tool transactions for over a decade, has redesigned their website with an emphasis on speed, convenience, and mobile accessibility with a host of new features. 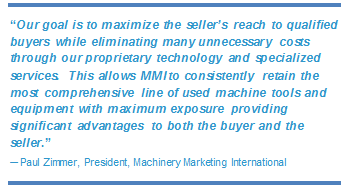 Since inception, MMI has been set apart in their commitment to making the process of buying and selling used machines as streamlined as possible, and the freshly revamped mmi-direct.com represents another leap forward in this regard. MMI’s impressive online storefront, which currently lists hundreds of quality used machine tools for sale, has been completely over hauled. The new robust search feature allows potential buyers to filter machines by brand, type, model, or keyword, to quickly hone in on the exact machine needed. Further expediting the process, a quick view option has been added as well. This allows users the option to view the images, videos, and specifications of a machine without navigating each individual listing, which will streamline the process and save time for MMI customers. The new related equipment feature will point buyers toward similar machines available for sale. If shoppers want to keep tabs on several machines before they make their decision, registered users will now be able to save individual machines or entire searches to review again at a later time. The new site has also been reorganized to make it easier than ever to let buyers and sellers alike take advantage of all of MMI’s specialized services. Buyers can now quickly receive quotes, see pricing and promotions, connect to financing specialists, and learn about MMI’s international rigging, transport, and installation management. Sellers can now receive a free online appraisal on their machines within 24 to 48 hours, offering many options that meet their timeline and budget through a cash deal, trade-in, or an MMI managed sale. With the managed sale sellers can choose either a direct sale or auction, and MMI will take care of the entire process—from listing to marketing to inspections to move out dates—built around the seller’s schedule.